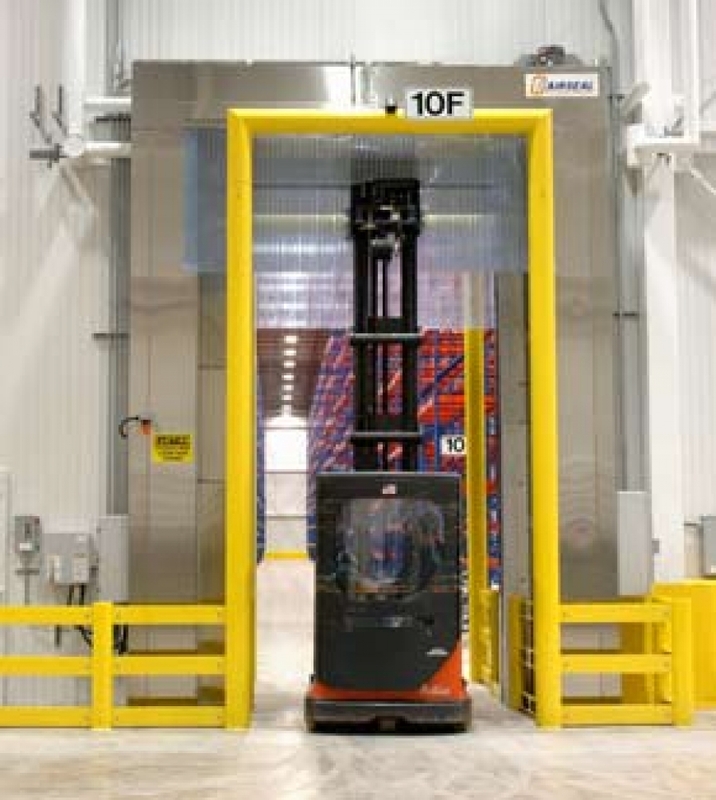 Double Horizontal Recirculatory Air Door With Fabric Roll-Up | Dock Door Systems Inc.
AirSeal’s 715DS invisible dual air barrier door with the integral high-speed fabric roll-up & automatic initiation provides high seal efficiency during slow traffic periods. AirSeal’s invisible dual air barriers allow for unobstructed traffic flow with reduced refrigeration loss and/or heat gain. Integral high-speed fabric roll-up door with automatic initiation which provides high seal efficiency during slow traffic periods. Integrated high speed fabric door with automatic initiation during slow traffic periods. Two-ply PVC impregnated polyester woven fabric. AirSeal: High efficiency low maintenance direct drive operators with minimum 5 h.p. motors. Fabric Door: In-line, high efficiency 3/4 h.p. electrical motor. AirSeal: 4,600 cfm each door at 4” of water gauge. Send & receive photoeye built in side frame. Electric activated instant reversing edge. Radio control actuator: single or multiple channel transmitter. Fabric door - barrel & operator shroud.Vision panel - 28" high across full width of panel. Emergency manual release on non-operator side of door.